Konami Digital Entertainment will celebrate the past and the present in Cybernetic Horizon, the latest booster set for its Yu-Gi-Oh! Trading Card Game releasing July 27. 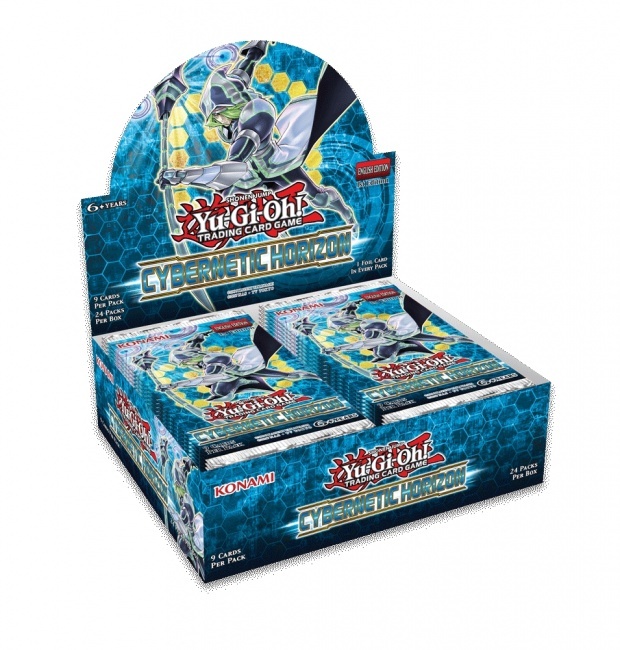 The first 100-card booster set of the 2018 - 2019 Dueling season, this set will modernize popular themes from the Yu-Gi-Oh! GX, 5D�s and ZEXAL eras. It will also provide new Link Monsters, and new cards to boost strategies introduced in Code of the Duelist, Circuit Break, Extreme Force, Flames of Destruction, and Dark Saviors, among others. Duelists with Cyber Dragon Decks will see new cards including a Link Monster that grafts its 2100 ATK on to other Machines. New forms of Demise, King of Armageddon and Ruin, Queen of Oblivion will arrive. Plus there are new cards for strategies including Mekk-Knight, Neo-Spacian, Dragunity, and Noble Knight. The set includes 48 Commons, 20 Rares, 14 Super Rares, 10 Ultra Rares, and 8 Secret Rares. This release will follow the Starter Deck: Codebreaker releasing in July (see �Powerful Link Monsters Join 'Yu-Gi-Oh! '�).